The Ref. 7763 Autavia is one of my favorites. It was my first vintage Heuer, and really kick off my interest for vintage watches. It's the second generation Autavia with snap-back case 30 min. register, and is driven by a Valjoux 7730. 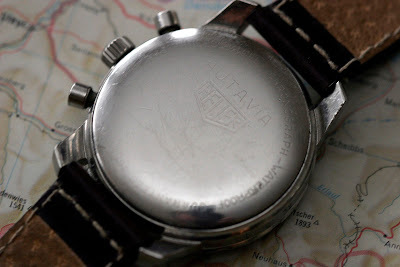 The back is marked with "Autavia" and the Heuer logo. There is two versions, 7763 TH with tachymeter bezel, and 7763 MH, with Miles/Hour bezel. They was listed in the catalogues from 1968-1971. It's quite big at 40,5mm, lug size is 20mm. To the left is Ref. 7763 as pictured in a Heuer catalogue from 1970. The price back then was US 105$ with Corfam strap, and US 120$ with a stainless steel bracelet. The case is stainless steel, and is super water resistant, tested at 330 feet, or 100 meter. The turning bezel (MH) has combined 60 minute and 12 hour division. The dial is black with two white register, running second to the left, and 30 min. counter to the right. 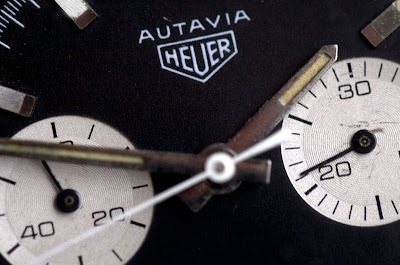 The Valjoux 7730 movement is signed Heuer-Leonidas on the bridge. The case back is also signed Heuer-Leonidas on the inside. The ref. number 7763 is stamped between the lugs. 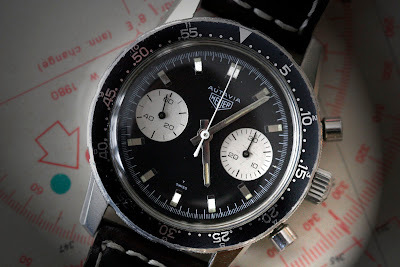 Just bought same watch myself - first 'pre-Tag' Heuer in my collection - not the last. Very impressed with it and it looks stunning.